On the last June 5th, UN-REDD+ Lam Dong Program co-operated with Provincial Youth Union and Lam Dong Youth Union Standing Committee Agencies to celebrate Launching ceremony of “World Environment Day and Climate and REDD+ Propaganda – Photos – Panel event”. Taken part in the ceremony, there were 300 unionists, youths from Youth Unions of the agencies, Provincial Youth Unions and some unit Youth Organizations. Especially, there was the encouraging attendance of Leaders from Departments, Sectors of the province and Da Lat people committee. This is one of the important activities of 2016, the year with theme “Go wild for life”. Main contents of this launching ceremony are propaganda, education and awareness raising heading to change behaviour of unionists, youths about climate change and REDD+; From then prove intelligence, youth power and voluntariness of youths in forest protection, scatter trees platting to contribute to protect environment, reduce GHG emission in order to cope with climate change. After launching ceremony, the Unions and unionists – youths committed to take part in environment protection activities at their offices and locals, base on their awareness and reality works, the ideas of “environment protection” will be transferred into messages on photos panels, in order to widely propaganda in the province. 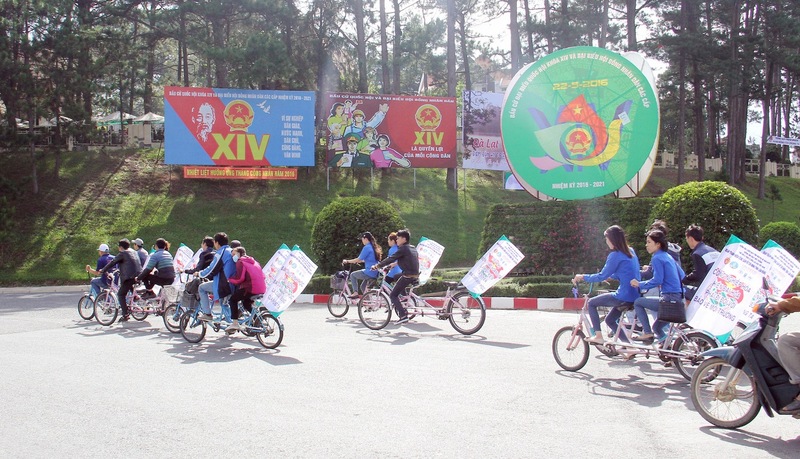 Launching ceremony of “World Environment Day and Climate and REDD+ Propaganda – Photos – Panel event” has raised up the movement of environment protection for Da Lat youth in singular and this city’s citizens in general. This is the reality work which contributes to develop Da Lat city and make it always a “Green, Clean and Beautiful” city in the eyes of Vietnamese and worldwide friends.